Somewhere in the Perigord Noir, every morning of the week, in every kind of weather, small farmers and market gardeners get up before dawn to drive their camionnettes to a village or town. They manoeuvre into narrow streets and squares, set up simple trestle tables, and unload boxes of fruit and vegetables harvested only hours before at the peak of ripeness. On good days , and most days are good, the Dordogne sun transforms ripe peppers to fire, honey to melted gold, and olives into baroque jewels. Egg plants, tomatoes, and cherries glisten, melons send messages to your nose and everything asks to be tasted. There are many other things to see and buy but most come here for the food. Vegetables, fish, eggs , truffles, asparagus and poultry, especially its world famous duck, salad greens and the cheeses, what a feast! They’re made from the milk of cows, goats and sheep. Some are hard, some soft. There are ranks and files of fresh white goats cheeses some powered with ash or wrapped in chestnut leaves. Each is displayed like a precious objects in a museum case. 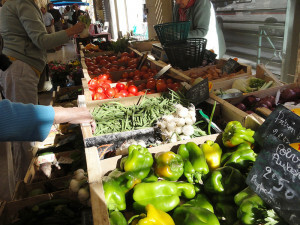 The market visit offered by Le Chevrefeuille as part of the cookery course is a fantastic part of the overall experience. We offer this market visit also to others who’s interested in knowing a little more about the local produce and how to use these ingredients effectively but do not wish to participate in the kitchen after. 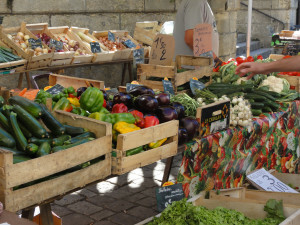 We arrive at Le Bugue market by 9h30 before the market gets too busy, to trawl the stalls on offer and to chat to the local stall holders and artisans. Whilst at Le Bugue market, Ian will show you what to look for, especially the diverse range of duck produces such as foie gras in its various guises, confit de canard, truffles and wonderful magret. Ian will share with you his ideas about cooking at home and eating out and invoke something of daily life in this part of south west France. We will provide you with ideas using regional food in ways you can recreate in your own homes with local supplies. Le Bugue market has existed for centuries but the cornucopia that is the open market today was not always so bountiful. War, drought and poverty was the defining aspect of life in the Dordogne for generations. 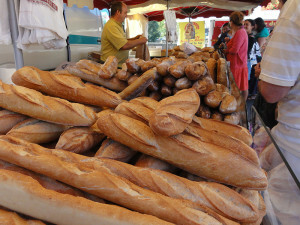 The love of good eating is central to french culture. compared to the modern world of fast food and supermarket sameness, the outdoor markets are an expression of a different style of living. They hew to traditional values of quality, freshness and presentation, operating in ways that have not changed materially for centuries. in an important sense, the open markets stand for continuity against the tumult of change in contemporary life. There are no secrets to shopping in the markets. It helps to speak some french but we have learned most of what we know by keeping our eyes open. When we buy vegetables we look for the word pays, which means local. On the small chalk boards or bits of cardboard stuck in the corners of the boxes. otherwise, the vegetables are marked with the region or country of origin. The supermarket has invaded France not only the big towns but villages too. People patronise it because they can save money and find items the weekly market dont carry. But in the end nothing replaces the open market, the vitality and enthusiasm of buyers and sellers, and the pleasure of doing business in this uncomplicated way. Nowhere else is the food so genuinely fresh from the earth and the hand that harvested it. Nowhere else does the wide blue sky, the warm sun and gentle breeze attend the act of marketing, not shopping but marketing, raising it from a humble necessity to a high art.